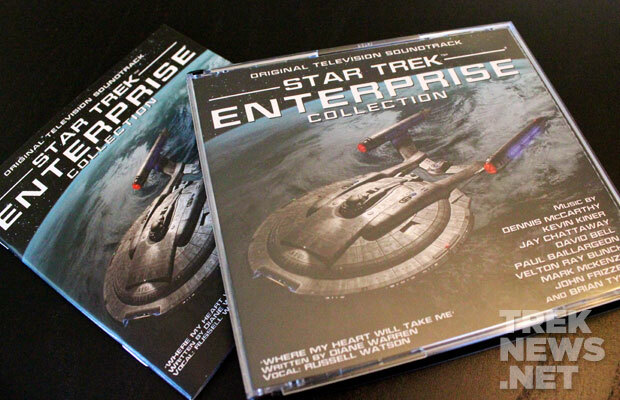 After a thirteen year hiatus, the first Star Trek: Enterprise music release has arrived! La La Land records once again returns to the Star Trek musical universe with this lavish four-disc set, released last Tuesday (12/2). The set contains a generous selection of scores from episodes spanning all four seasons of Enterprise, the prequel series set 100 years before the adventures of James T. Kirk. While series itself has received mixed reactions from fans and critics alike, it can be said that some of the best music written for Star Trek on television happened during the four season run of Enterprise. Why? Because it was the same, yet different. The first disc begins with the familiar song “Where My Heart Will Take Me” (complete with the warp out sound effect at the end) by Diane Warren and performed by Russell Watson. Fans will recognize this as the theme played during the opening credits of the show. This was a Star Trek first, as Enterprise is the only Star Trek series to feature a song as the Main Titles instead of the usual and familiar orchestral themes. Following the song, disc 1 contains score highlights composed by seasoned Trek TV composer, Dennis McCarthy. Those familiar with his style of composition will certainly recognize his sound here, as he added a new, yet heroic twist to accompany the journey of Captain Archer and his crew to explore the uncharted, pre Original Series Star Trek universe. Episode highlights include Shockwave, Impulse, Twilight, Storm Front parts 1 and 2, and more. Of particular note are the wonderful cues “Timeline Restored”, and “Home at Last” in which McCarthy beautifully brings the Xindi and Tempeoral Cold War episode arcs to a close. The second disc begins with another version of “Where My Heart Will Take Me”, followed by cue selections from another seasoned Trek TV composer, Jay Chattaway. Episode highlights include, Civilization, Bound, North Star, Zero Hour and others. Listeners will find the cue (Track 9; Sphere Builder on Board) from the action sequence at the end of Zero Hour of particular interest as it is 12 minutes of action and suspense! Concluding disc 2 is the wonderful End Credits instrumental of “Where My Heart Will Take Me”. Disc three contains scores from other composers, including David Bell, Paul Baillargeon, Velton Ray Bunch, Mark McKenzie (who himself worked with Jerry Goldsmith on other Trek scores including 2002’s Star Trek: Nemesis), and John Frizzell (Alien: Resurrection). Episodes “Horizon”, “Terra Nova”, “The Andorian Incident”, “First Flight”, and others are represented here — including the famous “Augments” episode, before the disc ends with “Archer’s Theme”, which was used as the show’s end credits. The final disc contains some real gems, primarily because the episodes included are all fan favorites. “In a Mirror Darkly” receives the most attention here with 18 tracks, as composers Dennis McCarthy and Kevin Kiner take listeners on a dark journey to the Mirror Universe and beyond. And after listeners return from that dark universe, they are thrown into chaos by Brian Tyler’s awesome score to the famous Borg episode “Regeneration”. As with many of Brian Tyler’s scores, this one is a wild and fun ride. After Tyler’s musical battle with the Borg, the baton once again returns to Dennis McCarthy who’s score to “These Are The Voyages…” is both beautiful and sad, as this marked the last scored episode of any Star Trek series on television. The cue to the ending montage scene is included here, and it will bring any Trek fan to their knees with its beauty and heroism, as the classic themes by Alexander Courage and Jerry Goldsmith make their appearance to signal the end of the series, while leaving room for hope of more adventures to come. Following this we are treated to another rendition of the end credits (“Archer’s Theme”) before the disc concludes the set with the theme for famous Paramount logo! Clocking in at nearly five hours of music, this set is truly a delight to behold and a must have for Enterprise fans and film music buffs. My only disappointment, is that the set wasn’t larger. But with CDs, there is something for everyone and almost no room for complaint. So sit back, grab a beer and let the composers take you on their journey into the Star Trek Universe. The limited edition Star Trek: Enterprise music set is available from La La Land Records for $59.98.